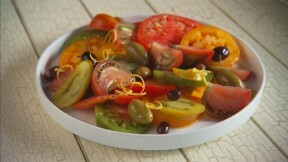 Arrange tomatoes and mixed olives on a serving plate. Zest 1 lemon over salad. Drizzle with olive oil and season with coarse salt and ground pepper.